Lois Lane is flying over the Atlantic Ocean on an assignment for the Daily Planet when she is spotted by a little girl. When the girl starts asking Lois about Superman and what he's like, she starts answering her questions up until she is asked if she is in love with him. Lois then, after hinting at her answer, walks to the lavatory and is stopped by two flight attendants who recognize her. They also bombard Lois with questions about Superman. In London, Mr. Perry White, a member of England's own Daily Planet, gets a call from Lois (who has now arrived in Africa) telling him that she got into a fight with both a flight attendant and an Air Marshall. Lois reassures Perry that she's not yet on the "No-Fly" list before getting in an army transport vehicle. In the vehicle, Lois is questioning the troops about the mysterious "Angel of the Plateau" who has been taking down African warlords bare-handed. But before Lois can get more information, they are ambushed. Lois is told to stay in the car, but she does just the opposite and as a truck is blown, Lois is trapped under it. As she pulls herself free, her Superman signal watch is removed. As her and a soldier are running away from the war-zone, another truck is blown up and is headed toward Lois. Suddenly, the truck is caught and Lois is saved by none other than... Lana Lang? Story - 3: For the record, compared to what my fellow Smallville reviewer and friend, Marc Pritchard, would have rated this, I'm being generous. But before I am called a Lois Lane or Lana Lang hater or bashed for having an opinion that is different from the general consensus, I have to make this very clear, I was really (and still am to an extent) looking forward to "Valkyrie"! I mean that honestly too! 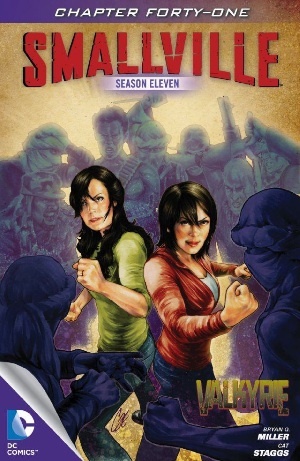 As most know, I am a huge fan of the Smallville TV series and now the Season 11 comic. If I was not, I would not have spent so much of my time committing to the series and comic. Outside of the Homepage, I also work as an Admin on a podcast network and we have interviewed Mr. Bryan Q. Miller three times and are working on another. Obviously, I do not hate to just hate as I loved "Guardian," "Detective," "Haunted," and "Effigy" as you guys know from my podcast or Homepage reviews. I also do not praise the book simply because I have had the pleasure to speak with BQM himself, I praise it (for the most part) because it's a good, fun, and exciting continuation of a series that we honestly wanted more of after the last 30 seconds of "Finale"! That is a fact. What is also a fact is that I was under-whelmed by Chapter 1 of "Valkyrie". Here are my problems with this issue, which again, are my own opinions. First off, I was not a fan of the whole conversation between Lois and the flight attendants. I mean, Lois wasn't very comfortable with it either, but I really felt uncomfortable reading it. "How much man is steel?" Ummm, what!?!?! Now, I did talk with Marc about this chapter as well in a series of emails (we're both much more excited about "Argo" than "Valkyrie" and I'm jealous that he's covering it and not me) about this chapter and as I'm sure he'll talk in the Comments section I won't steal his thunder, but we were both a little put off by this. I mean, clearly Lois Lane is engaged (as Lois does say) so clearly she wouldn't be (to the normal person's perspective, and trust me, these attendants are not normal) wondering about Superman's private parts. I mean, come on. Ultimately, that really turned me off to this issue from the start, and I know it may sound stupid (if I may steal Marc's word-of-the-week from last week), but it was just really unnecessary and, well, stupid. Now, still connected to that, I understand that Lois punching the Air Marshall and the flight attendant was a total "Lois thing to do," but it was a "Lois thing to do" from back in Seasons 4, 5, 6, and maybe 7. Why would Lois punch a flight attendant for asking about Superman's manhood (again, uncomfortable), especially when that could jeopardize Clark's identity? And I mean that in the sense of, why would Lois have those kinds of feelings for Superman if she is engaged to a "mild-mannered reporter". But back to my point, if you look at Clark in Season 4 of Smallville and then look at him now, he's very different. Clark was, and never will be, perfect, but he's definitely better now. Lois in this issue, at least to me, seemed the same as she was in Season 4. If Lois Lane cannot grow alongside Superman, then what is the point in them being together (I know I'm opening myself up for persecution here) if she is always going to remain the same with no character development? Now, I do acknowledge and like the character development in Lois in Seasons 7-10 and even into 11, but here it seemed like she was reverting back to what she was a long time ago, and I didn't like that. Those being my main problems with this issue I will now talk about what I did enjoy. I really liked the scene between Lois and the little girl (before the flight got awkward). It felt to me like Lois was almost being a role model for this young girl and that's very cool, because Lois Lane has been a big role model to a lot of female comic book fans simply because of whom she is. Like I said above, this issue may not have been the best example of Lois being the Lois Lane who we all know, but this scene certainly took the cake this week. Fun fact: Lana is the same woman we saw in "Haunted" watching Clark and Bart race across the water when they passed Africa. That teaser was setting up this story. Either way, I don't want people to think I HATED this issue, because I didn't and it had its gems and I enjoyed those gems, but some of the Lois stuff was very out of place for me, and even out of character. But what do I know? I only watched the series for 10 years and have read Superman comics all my life, so there you go. Anyway, don't forget to come back next week for Marc Pritchard's review on Issue #42 "Argo - Part 1" (very jealous Marc...) and come back in three weeks for my review on Part 2 of "Valkyrie"! Again, this is just a teaser to the over-all story so I give it a bit of slack, but it really didn't hook me as much as the "Effigy" teaser. Thanks guys, and let me know what you thought. Art - 4: Cat Staggs has always done an amazing job with the cover art for each episode of this series and I have very much enjoyed them. I really did enjoy her interior artwork in this issue and I hope that she will have the opportunity to do more interior art for this book outside of "Valkyrie". Cover Art - 5: Honestly, I just really liked how it looks. It's cool to see Lois and Lana side-by-side in a fighting stance fighting off war-lords. It's very cool and I look forward to seeing that happen in the actual book itself.